Idag är det fredag och det betyder inte bara att det bara är några timmar kvar till helgen, utan även att Netflix har levererat en hel del nytt till streamingtjänsten. 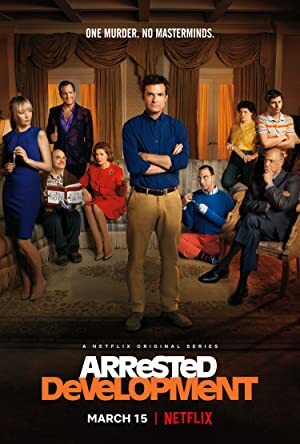 Först ut har vi andra delen av femte säsongen av Arrested Development som har släppts på Netflix. Känner ni att ni vill ha lite mer brittisk humor har även Turn Up Charlie premiär idag. I serien får vi möta Idris Elba som spelar den avdankade DJ:n Charlie som blir barnvakt. Men vänta, det kommer mer! Tim Millers och David Finchers animerade antologiserie LOVE DEATH + ROBOTS har också premiär idag. Andra delen av den femte säsongen av Arrested Development hittar ni via länken här nere till vänster. Meet the wildly dysfunctional Bluth family. This family was once at the height of real estate development in Orange County, California. But when the family business - the Bluth Company - goes bust, they're suddenly found penniless with their assets frozen. They move into their last remaining asset - the model home left over from their latest housing tract. Their luxury vehicles are replaced with a reminder of the family's former wealth - the stair car that accompanied their private jet. The patriarch of the family is George Bluth - he's now in prison, and loving every minute of it. His wife Lucille and daughter Lindsay are spoiled socialites who can't handle getting kicked out of family restaurants. His son Buster is in his mid 30's and lives at home. His son George Oscar Bluth is a magician who started a group to get magicians to be taken seriously - and gets kicked out when his own tricks are revealed. Lindsay is married to a man named Tobias Funke, once a psychiatrist, who decides to become an actor. The only sane member of the family - Michael Bluth, along with his son George Michael, want nothing to do with the family business. But one bizarre circumstance after another keeps Michael and George Michael from leaving their eccentric family.